Sir Elton John is a singer, songwriter, composer, pianist, actor, and record producer. Sir Elton John one of the best selling music artists in the world. Sir Elton John has sold more than 300 million records in his five decade career. 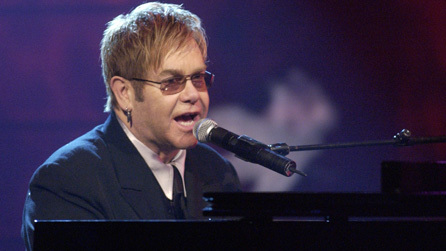 Sir Elton John's single "Candle in the Wind 1997" sold over 33 million copies worldwide and is "the best-selling single of all time". Sir Elton John has received six Grammy Awards and Sir Elton John won the Academy Award in 1994 for Best Original Song for 'Can You Feel the Love Tonight' song from movie 'The Lion King'. Sir Elton John was born on 25th March 1947 Pinner, Middlesex, United Kingdom. Let’s remember Sir Elton John’s birthday with Top Ten Famous Sir Elton John Quotes. At heart I've always been a music fan. That part of me has never changed since I was a little kid, sitting in a room watching a record go round, looking at the colour of the labels. I'm a great lover of children. I never thought that one day I'd actually be a father, but I'm very pleased that I changed my mind. Children are extremely important. They are the future of the world. I've had an amazing professional life, personal life, but at 64 to have a son who gives us that much love and enjoyment is, wow! For me, music is so passionate, I have to give it my all every time I go onstage. Onstage, it was always comfortable for me, because that's where I felt at home.